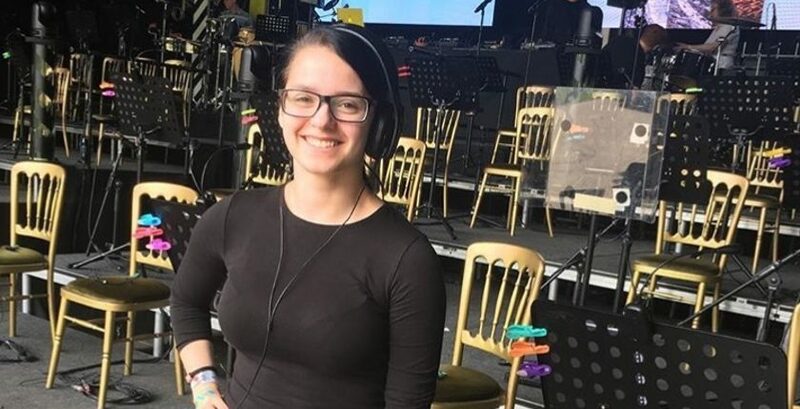 A budding sound technician has kicked off her summer in style after helping run the sound at a festival in front of a packed arena. Toni Kilsby, a Sound Technology student at Wrexham Glyndŵr University, helped to set up and test equipment for the Haçienda Classical performance at the Highest Point Festival in Lancashire. Haçienda Classical – now touring the country – features an orchestra playing new versions of classic house records and has already featured in festivals across the globe, including the opening performance at Glastonbury last year. Toni, from Preston, said: “Working at a large event such as a festival, to me, was more fun than just being a festival goer. She said: “Students should take full advantage of the resources they have access to – asking your lecturers to notify you when an opportunity comes up is a good start. It is so important to take every opportunity you can get to build up your work experience, whether the opportunity finds you or you find it. Despite knowing of his long history at the heart of dance music, Toni said she still found watching one of her lecturers take to the stage at a festival an odd experience. She said: “I was very aware that he was a DJ, so I expected it. However, seeing him sing was a shock. I was told last minute that he was filling in for somebody else.